The deal is in the final stages of closing, they said. Both declined to reveal the deal amount. All of VOW CarClinic’s customers base, technology assets, and service partners will be on-boarded by GoMechanic over the next few weeks, Abhishek Menon, co-founder of VOW CarClinic, told VCCircle. “The deal boosts GoMechanic’s added capability and momentum to strengthen its B2C vertical focus, in addition to cementing its leadership position within technology-enabled automotive services delivery space. This will help foster our growth agenda and achieve greater things ahead as we gear up for Mumbai operations launch in early 2018,” Kushal Karwa, co-founder at GoMechanic, said in a statement to VCCircle. GoMechanic, run by Targetone Innovations Pvt. Ltd, was founded in April 2016 by IIM-Ahmedabad alumni Amit Bhasin and Karwa. Later, Nitin Rana and Rishabh Karwa joined the founding team. In December 2016, GoMechanic raised $250,000 (nearly Rs 1.68 crore then) from seed investment and innovation platform Venture Catalysts. 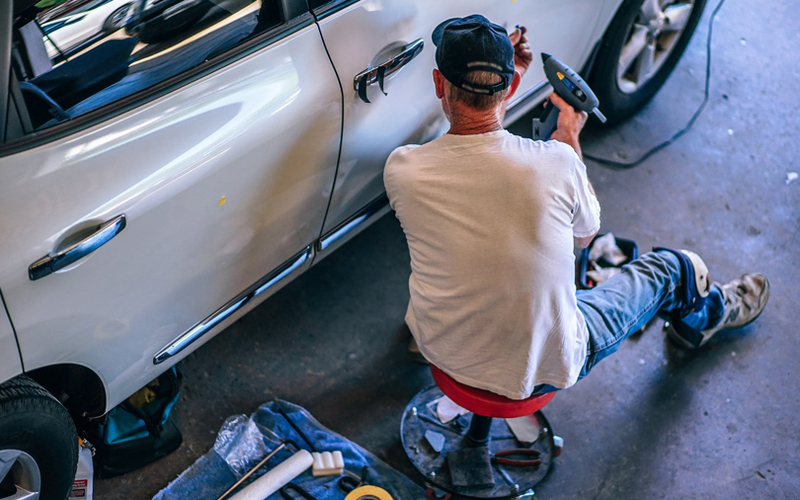 The startup connects users with automobile repair and maintenance service providers in the vicinity and provides original spare parts for all the services booked at its partner service centres. In February this year, GoMechanic secured Rs 2.5 crore in seed funding from venture capital firm Orios Venture Partners and angel investor Dhianu Das. VOW CarClinic, run by GreyHair Ventures Pvt Ltd, was founded in early 2016. It is a marketplace for car servicing and repair needs in the online-to-offline consumer Internet space. Users can avail of the firm’s services via a website and mobile application. It was established in 2015 by Menon and Harmeet Singh Hora, both of whom are alumni of the Indian Institute of Management, Indore. Hora has previously worked at The Boston Consulting Group, Samsung Electronics and TEN Sports, while Menon has held stints at management consulting firm PwC India and oil major Total. In January this year, VOW CarClinic raised an undisclosed amount of angel funding from Vishal Malik, founder and director of IT services firm Gemini Solutions and a group of Indian Institute of Technology, Delhi alumni. A number of startups in the car servicing segment have recently raised funds. On Thursday, VCCircle reported that online auto services startup GarageOnRoad secured seed funding from a senior executive at reinsurance multinational Swiss Re. In October, two-wheeler servicing startup Let’s Service secured pre-Series A funding from aerospace components maker Aequs Group. In September, after-sales car service provider Pitstop raised $1 million (Rs 6.5 crore) in a pre-Series A round from Blume Ventures, Singapore-based Goldbell Group, and a group of angel investors. In June this year, automobile parts marketplace SparesHub.com raised Rs 2 crore ($311,000) from The Chennai Angels, Singapore-based Anthill Scale Ventures, US-based Esvee Technologies Inc, and Inc95 Consulting.